SYBO Games has released its newest endless runner, challenging players to defeat monsters as they collect pets and other loot. 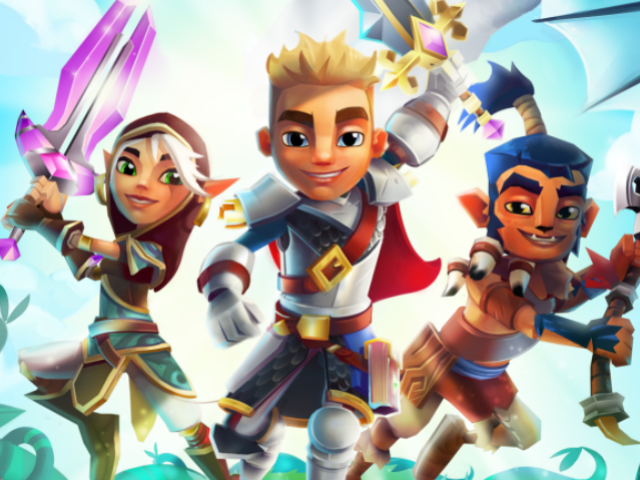 Subway Surfers creator SYBO Games has announced the release of its latest endless runner, Blades of Brim, on iOS. In the game, players will run through the land of Brim as one of a variety of characters, engaging in combat with monsters, and collecting loot, pets and more as they progress. Speaking with SocialTimes, SYBO’s co-founders, Sylvester Rishøj Jensen (also SYBO’s creative director) and Bodie Jahn-Mulliner (SYBO’s CEO), told us the game was designed to be “easily accessible for fans of endless runners and people new to this type of gameplay.” While familiar, Blades of Brim includes many fresh elements, like running paths of varying altitudes, portals to different areas and more. The base gameplay of Blades of Brim sees players swiping left and right to move across multiple running lanes, and swiping up to jump. During each run, players will encounter a different assortment of obstacles, from thorns and boulders to large gaps in the path. Players can race up and down ramps, wall-run and/or jump to reach higher platforms and more, but must always watch out for the many enemies located along the path. As players approach enemies in different lanes, swiping left or right makes their hero attack. When enemies are in the same lane, players swipe down to roll into them. Some enemies require multiple hits to defeat, and each enemy can also attack players if they don’t attack first. Players collect coins, chests and even premium currency as they run, but won’t keep their loot unless they reach stash points in the path. Passing stash points also increases the run’s overall difficulty going forward. When gamers fail, they can spend premium currency to revive their character in hopes of reaching these stash points, or choose to start over. Thankfully, each runner can take multiple hits before the game ends, and his or her health recharges if players survive for a time after the attack. Players will also unlock new pets and mounts as they play, like wolves or horses. Each can be summoned for a limited time by double-tapping the screen while running, and each has a different special power. For instance, Blaze, a fiery horse, can shoot fireballs at enemies, while Icehowl, a wolf, shoots ice beams at monsters, and so on. These pets can be upgraded to activate permanent score bonuses. It’s worth noting, players need pet whistles to actually summon pets, with whistles available for purchase in the game’s store. The mounts are a heck of a lot of fun. They also present an interesting feature in the game, so if you’ve ever wanted to ride a dragon in a game on your phone, guess what? Now you can! The mounts get you into and out of all kinds of danger, but be careful! Once you get a mount, there’s no looking back! You never want to be without your friend. In addition to upgrades for pets, gamers can spend their coins and premium currency on chests containing items like weapons, pets or pieces of armor. Like pets, these weapons can be upgraded to unlock overall score bonuses. SYBO is no stranger to success on mobile, as its Subway Surfers has been downloaded over 700 million times since May 2012. As the creators and IP holders of Subway Surfers, we are aware of the attention, but Subway Surfers lives on. We’re all avid gamers and games are a massive part of our lives whether we’re developing games or playing them. We use that motivation and really go for it with everything we make.